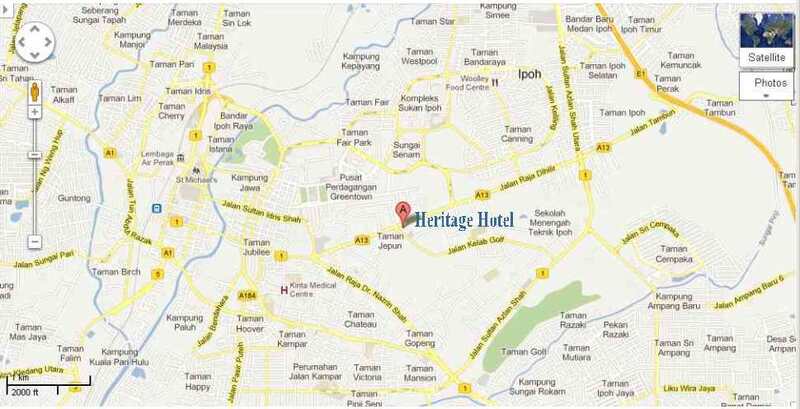 Just a few minutes from the North-South Highway interchange into Ipoh City, you will find The Heritage Hotel. Directly adjacent to the hotel is Ipoh's famous Turf Club. And from the top-most floors of the 11 storey high building, guests are treated to a birds-eye view of the proceedings. Also, within 'putting' distance is The Royal Perak Golf Club, where the tranquil greens of this 18 hole course, gently soothes the weary spirit....especially after a hard-days work. From Penang - 190km or about 2 hours 15 minutes drive. From Kuala Lumpur - 220km or about 2 hours 30 minutes drive.